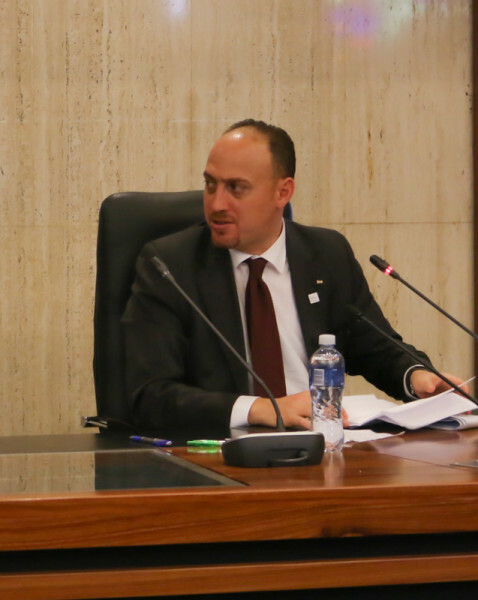 Wits SRC and the City of Johannesburg took a pro-Palestinian stand yesterday, as they hosted a presentation with guest speaker Dr Husam Zomlot. Wits University SRC and the City of Johannesburg hosted a pro-Palestinian presentation, at Wits main campus yesterday. This event was part of a series of events put together to celebrate the relationship between South Africa and Palestine by the City of Johannesburg. This follows the signing of a memorandum of understanding between the City and Ramallah. The guest speaker was Dr Husam Zomlot who is the director of the Commission for International Relations in Palestine. Wits SRC President Mcebo Dlamini visited Palestine in November and said at the presentation that what is happening in Palestine now “it is an advanced form of colonialism from what we experienced here.” He said that negotiations will never assist anyone because there are those who have power of the media. “We are expecting us, as leaders of the SRC, to be charged as well after making this speech because racism is still here in this university and it is still run by rationalists and people who do not want to hear the truth,” said Dlamini, when referring to taking a stand against Israel. Zolmot said that Israel has won every battle against the Palestinians but has lost the war, with Palestinians having won on all moral, political and legal fronts. “Israel want the occupied land more than what they want peace,” said Zolmot. He said Israel would rather be known as an apartheid state than relinquish control.